As the old saying goes “Less is more” however in the real world, more is usually more. In Bayliner’s world, their philosophy is “More, for Less” and that is exactly the case with the 2017 Bayliner VR6. The bigger sister to the award winning VR5, the VR6 is a full 2 feet bigger and it certainly shows when sitting dockside. 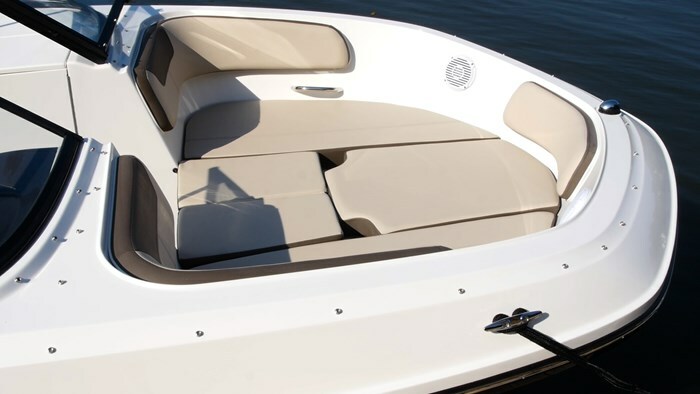 The VR series features striking style lines that provide usable function for boat owners. The first of which has to be the “BeamForward” design. Taking a few steps back off the bow of the VR6 you would notice how much of a dramatic flare out the lines of the boat take, as it moves up from the V bottom. This flare allows Bayliner to carry the full 8 feet of the beam forward into the bow rather than tapering it off to a sharp point like bowriders of old. What this does is gives you a tremendous amount of usable space, for lounging, storage and for people. There are 3 distinct storage spaces: one on each side and one directly forward, with a pair of drink holders and grab handles. Anyone can make a wide bow but the space on the VR6 is also deep, which is quite important when it comes to safety. The VR6 is not a new model for 2017 but it’s already getting some updating for the upcoming year as the two side panels of the curved windscreen are now gone, giving the boat a sharp, modern look. The extra 2 feet of space the VR6 has is put into the most usable part of the boat, the cockpit. Functionally this space is a leader in its segment as it can take on many roles. 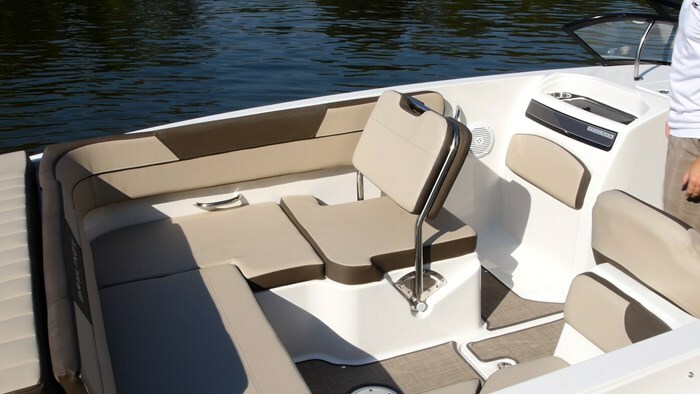 If water sports is on the docket, you can put the conversion companion seat all of the way down to form a large seating area along the entire port side with a backrest on the console for facing behind towards the action. Behind the helm seat is another rear facing seat, again, for keeping an eye on the rider. But say you want to lounge out in the sun, kick your feet up and work on the tan. Then keep the companion seat in the down position, add in the starboard walkway filler cushions and prop the walkway door up and you have a large sunpad lounge along with a U shaped cockpit lounge inside of the boat. 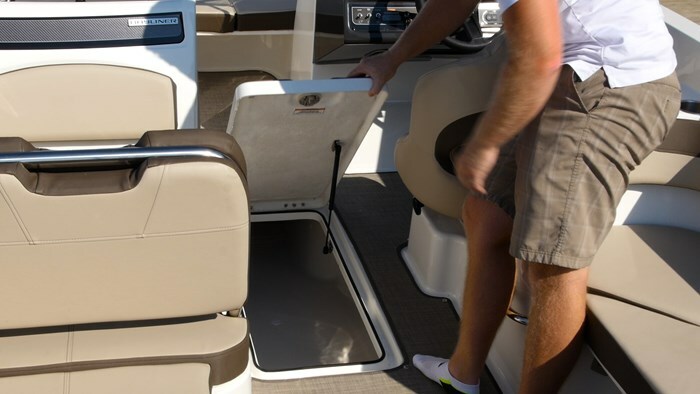 When it’s time to run back to the marina, keep the filler cushions in and sit forward along the aft bench seat, put the walkway door all the way down and move the companion seat all of the way up to the aft position and that seat converts to a forward facing seat. 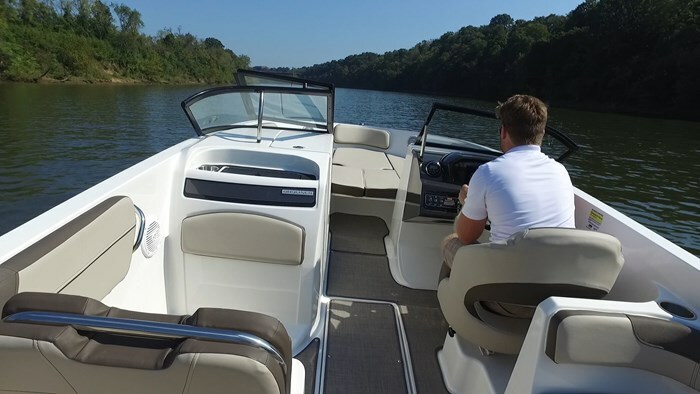 The fact that Bayliner is able to make such a great use of this space, is of course thanks to the extra 2-feet, but also because they make full use of every inch with their “AftAdvantage” concept, which pushes the usable space of the boat all the way to the very edge of the running surface. There is, of course, still a swim platform (which is quite spacious also) but it is added on after to not take away from the usable cockpit space. It’s thanks to these simple, yet functional design elements that give the VR6, at 22-feet 4 inches, the usable space of a 25-foot runabout. Storage, and plenty of it, is not just a priority for Bayliner, it is a brand philosophy and the VR6 is not one to disrupt that. A large ski locker is found midship in the floor, and the port console opens to reveal a locking change area that can be turned into a head with a small upgrade. Storage continues both under all of the bow cushions and the cockpit as well. More usually means more. So when you have a 10-person capacity you’re going to need lots of life jackets, towels, sunscreen and water toys so you’d hate to run out of space. In the VR6 you can bring it all with space to spare. When you have that many people on board you want to make sure you have the power to get up on plane quickly and the VR6 I tested had the optional 250-hp 4.5L MerCruiser, an upgrade from the standard 200. Powering a boat is always a tricky balance, especially at this size because again, you want that power to get out of the hole and on plane, but when you add power you’re driving the cost up. 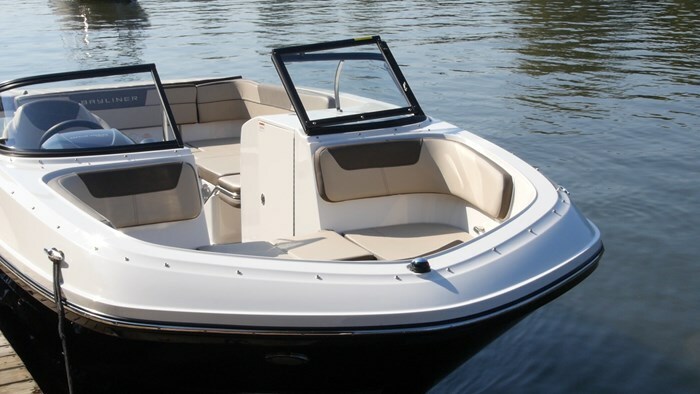 As we found out during our walk through at the dock, the VR6 is a functional boat, with intuitive design and versatility. This continues away from the dock as this model featured Mercury’s new Active Trim system, Basically it’s an automatic trim setting. Now before you can even start to say “I know how to trim a boat” I’m going to stop you right there. Powered by a computer that takes into account as many variables as it can, including speed, water depth, engine rpm and fuel consumption to name a few, Active Trim makes sure you’re always in the optimal position. I’ll admit that the first time I tested a boat with it, it took about 30 seconds to get used to not trimming, but once I put my faith in it, my immediate reaction was “this is fantastic.” Getting on plane and reaching a top speed are one thing when it comes to trim, but where Active Trim really shines is when you go to turn. When you turn your boat, you can keep both hands on the wheel while Active Trim does all the work. I tested both port and starboard full lock turns, and not once did we cavitate. This is the true magic of Active Trim. 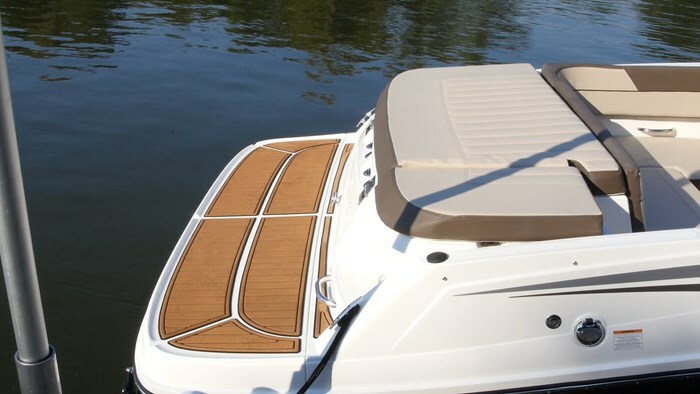 But of course, it takes two to tango, and Bayliner has built a heritage on their V bottom running surfaces. Bayliner traditionally uses multiple strakes on their hulls, which will keep it on plane at lower speeds, but also helps it track in the turns, and the VR6 was no different. The VR6 has a dry weight, with standard engine, of 3,797 lbs. Add in fuel, oil and other essential fluids, gear and myself with a cameraman and you’re going to be close to 5000 lbs. The 250-hp 4.5L MerCruiser got the 22’4” VR6 on plane in just over 3 seconds, which I was more than satisfied with because the bow rise was rather tame. One of the things that really stood out to me when I tested the VR5 was how quiet the interior was when running at speed and this VR6 was no different. The VR series uses a full deck liner which is going to eat up all of that water noise against the hull, giving you a quiet ride at speed where you can have a conversation with your guests without yelling. When I settled into a comfortable cruise of 27.4 mph at 3000 rpm, all I could really hear was the wind and the water breaking off the hull behind me. When you test drive a new car, you almost always are going to want to take it on the highway. This way you can see how it handles high speeds and there you can “just tell” when a car is built well. Well it’s the same thing with a boat. When you get it up to 30, or even 40 mph you can sit there and observe and you can just tell when a boat is built well, and the VR6 certainly is. I felt confidence at speed, all the way up to a top speed of 52.1 mph. I love the direction Bayliner is headed with this new VR series. 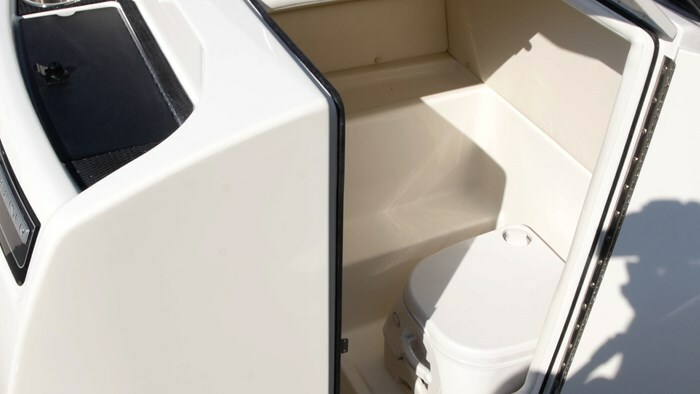 Both the 5 and the 6 offer a lot of value to boaters by giving them plenty of space with the ability to simply do more. In fact I even heard a rumour that Bayliner will be discontinuing the 185 - one of the best selling boats of all time, because they’re that confident in the direction of this new series, so don’t be surprised if we see a smaller one in the future to round out this impressive line-up.